I’m going to talk about Bit­Coin today. I need to write more, and you write what you know, and late­ly I’ve been spend­ing quite a bit of qual­i­ty time with all things Bit­coin. Heck, you should all imme­di­ate­ly for­get about Bit­Coin (this is not the blog you are look­ing for) and leave me to my mon­ey grub­bing ways. But that’s not very nice, so I will pro­ceed. Bit­Coin is a new cur­ren­cy that is not asso­ci­at­ed with any­thing but the bits it’s made of. It doesn’t have a coun­try, it doesn’t have a pre­cious met­al or com­mod­i­ty that backs it and it doesn’t have a spon­sor­ing orga­ni­za­tion oth­er than the loose col­lec­tion of peo­ple that use it. Bit­Coin can be trad­ed for var­i­ous oth­er cur­ren­cies on exchanges that sup­port trad­ing Bit­Coin. Sign up with Trade Hill and I’ll get some kind of kick­back. Trade Hill is not the only mar­ket, but it’s a big new play­er now that the incum­bent “MtGox” has been hand­ed their lunch by some hack­ers. If you’re inter­est­ed in the Bit­Coin Mar­ket, the Bit­Co­in­Charts Mar­kets is a good place to start. Bit­Coins have trad­ed as high as $30 USD per Bit­Coin and after their recent crash (where MtGox was hacked) have rebound­ed to $15.50 (as-of-when I’m writ­ing this). But why anoth­er new cur­ren­cy? Why anoth­er new online mon­ey-wal­let-pay­ment thing? The sim­ple answer is that some peo­ple don’t like how things are run right now. Pay­Pal is rather auto­crat­ic, Byzan­tine and, many feel, out-of-touch. The cred­it card com­pa­nies and their friends “The Banks” are even fur­ther from the online mar­ket … fun­da­men­tal­ly not under­stand­ing micro-pay­ments or even what peo­ple want online. Maybe the most com­pelling rea­son is that some of us would like some “cash” to use online. I don’t mean we want you to give us mon­ey (but feel free — real­ly…), but “cash” as in sim­ple and anony­mous cur­ren­cy to be spent in with­out incur­ring pay­ments to oth­er busi­ness­es where the amount of mon­ey you have in your wal­let is both yours (your mon­ey) and easy to spend with­out hav­ing a third par­ty look­ing over your shoul­der. This is a very Lib­er­tar­i­an con­cept. If you think about how you use your cred­it card, the fees are legion. You pay fees to have the card; you pay fees if you don’t pay your bal­ance; you pay fees if you go over your lim­it and you pay lots more fees. The mer­chants are no bet­ter off: they pay fees to accept your pay­ment; they pay more fees if your card is spe­cial; they pay fees just to have the machine to accept your pay­ment. Deb­it cards are only slight­ly bet­ter and most oth­er “new­fan­gled” pay­ment solu­tions may vary “how” you pay (touch, swipe, chip, etc), but not how many oth­er peo­ple you pay (they are still wrought with fees). Core to the Lib­er­tar­i­an heart is the con­cept that while gov­ern­ment has it’s uses (and in this case big busi­ness is grouped with the gov­ern­ment), it is not required for the day-to-day inter­ac­tion between peo­ple. Think about cash. If I give you a dol­lar, nobody gets a cut. You now have a dol­lar. If you an I have a dis­pute about the dol­lar or the prod­uct you sold for the dol­lar, we have to work it out our­selves. There is nobody to “charge back” the dol­lar. If you then give that dol­lar to some­one else, there is no record that you got that dol­lar from me. Indeed that dol­lar can change hands dozens of times before it returns to the hands of the “gov­ern­ment”. Most of our cur­ren­cies are backed by gov­ern­ments, but some exam­ples of barter cur­ren­cies exist… usu­al­ly cre­at­ed by oth­er com­pa­nies. Cur­ren­cies are no longer backed by gold or some oth­er “real” thing — in that respect, Bit­Coin is very sim­i­lar. They only have val­ue in so much as you trust that you can spend them some­where for some­thing. Bit­Coin tries very hard to be “cash.” You can’t spend it effec­tive­ly with­out com­put­ers, but the design and imple­men­ta­tion of Bit­Coin is fair­ly anony­mous and gen­er­al­ly free or at least cheap to form trans­ac­tions. This is a very dis­rup­tive idea. Right now, you can’t move much cash with­out one or more gov­ern­ments know­ing, but Bit­Coin is built to resist even the impo­si­tion of these types of restric­tions. Every Bit­Coin trans­ac­tion is pub­lic, but nobody knows whose trans­ac­tion it is. I’ve spent all this time talk­ing about Bit­Coin with­out talk­ing about what I’m doing with Bit­Coin. First of all, I’m min­ing. I don’t recomend min­ing … because if you start min­ing, I poten­tial­ly make less mon­ey. 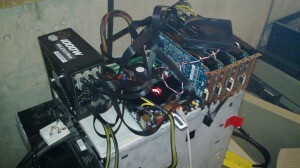 The sys­tem at the right here has four ATI 5830 video cards in a sin­gle moth­er­board (with many fans). It draws about 775 watts, but it uses that pow­er to gen­er­ate about one bil­lion hash­es per sec­ond. For this, right now (at the cur­rent dif­fi­cul­ty) I make about one Bit­Coin per day. I’ll let you know lat­er if it was worth it. If you’re curi­ous, the sys­tem is sit­ting on top of a Matrix 5000 UPS which pow­ers the emer­gency light­ing and com­put­ers in my house. Maybe I should post on that one day. I’m also work­ing on a site that sells com­put­er hard­ware in exchange for bit­coins. I’m hav­ing a bit of trou­ble with the shop­ping cart, but watch BitCoin2go.com for future devel­op­ments. I sup­pose, at heart, I’m a bit of a Lib­er­tar­i­an rather than a Con­ser­v­a­tive or a Lib­er­al. I believe that peo­ple should be respon­si­ble for them­selves and their actions and not liv­ing in a cocoon craft­ed for them by the state. Many aspects of the “nan­ny” state both­er me great­ly. Maybe I’ll rant on that more short­ly. This entry was posted in Life, Politics, Tech and tagged bitcoin, conservative, currency, liberal, libertarian. Bookmark the permalink.